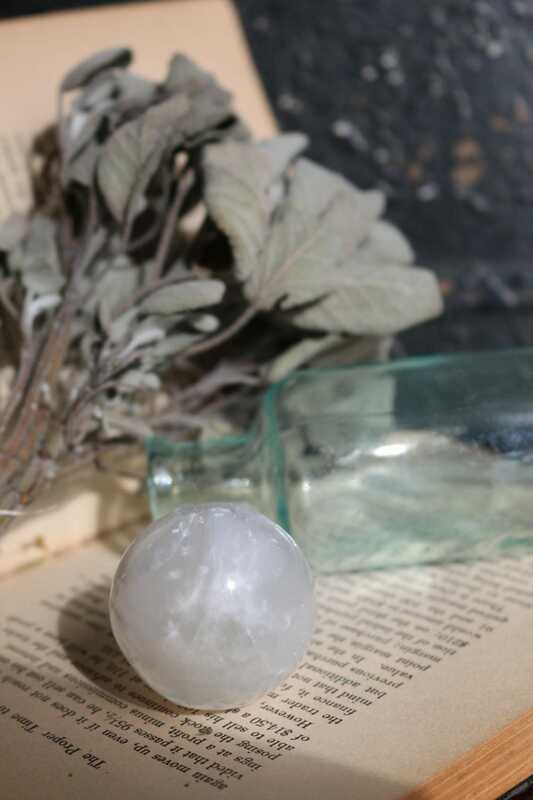 A small, polished Selenite Sphere which resembles the moon, especially at night when placed on a window sill. Due to the irregular shape of this piece, dimensions are approximate. If we are currently sold out, have no fear as we restock frequently. Please notify us if you would like to be included in our customer profiles. The Sphere symbolizes wholeness and as is an ancient and universal symbol that represents unity, completeness, infinity and the universe as a whole. 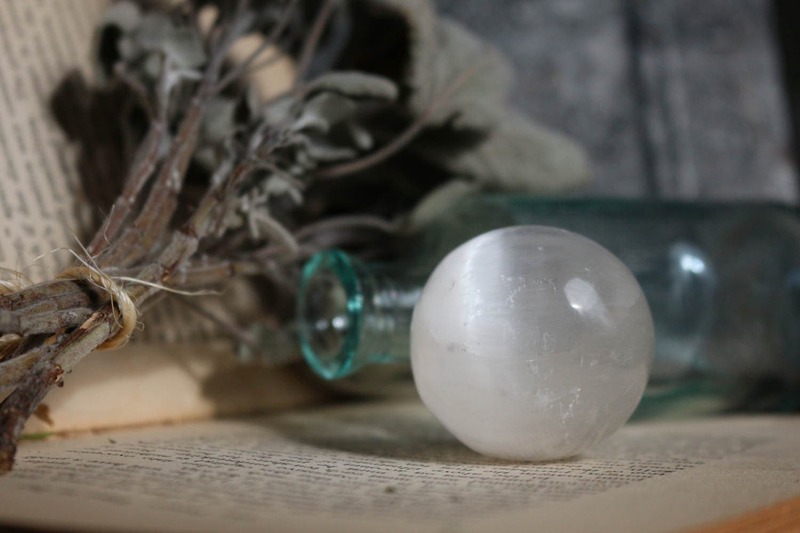 Intimately connected to the spiritual nature of our complete self, crystal spheres help to bring out integrity, clear thinking, and a better union of body, mind, and spirit. As far as energy direction, a Sphere emits energy in all directions equally. 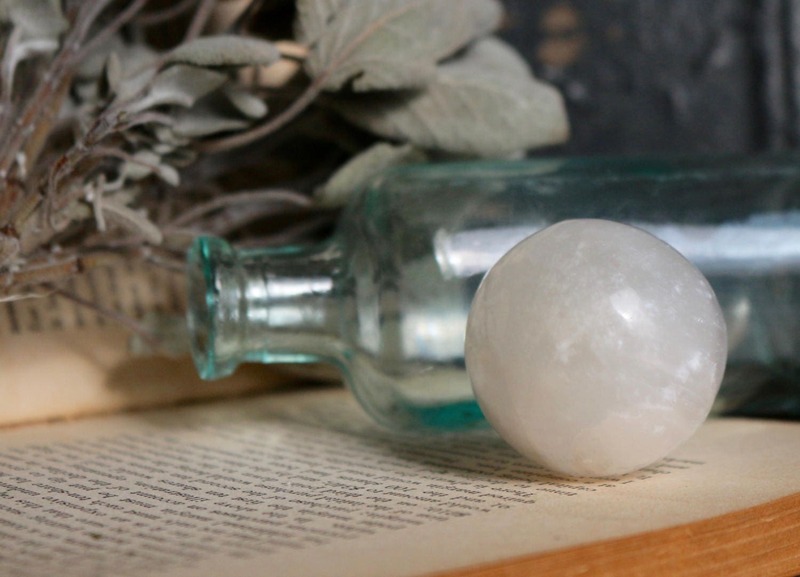 Selenite is named for Selene, an ancient Moon goddess. Its vibration brings about mental clarity and helps you to access angelic guidance. Selenite is known to dispel confusion and allows you to see the bigger picture while instilling a deep peace. 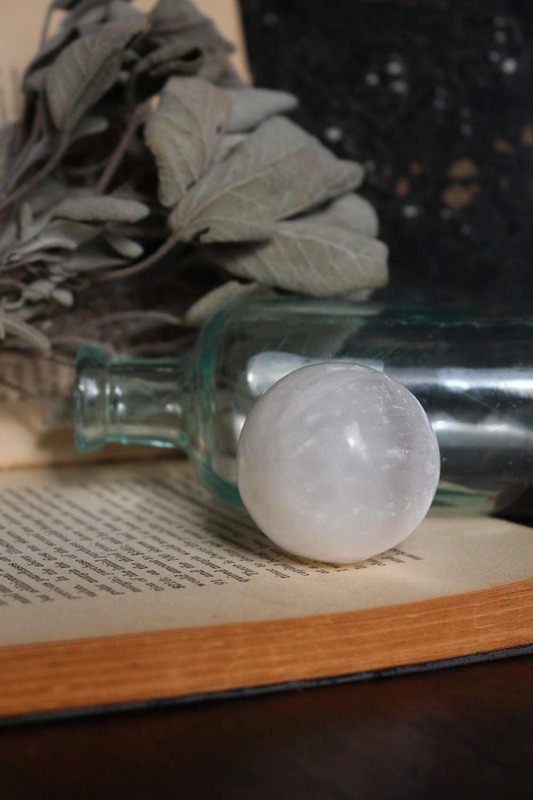 Selenite is also known as a wonderful protection stone. 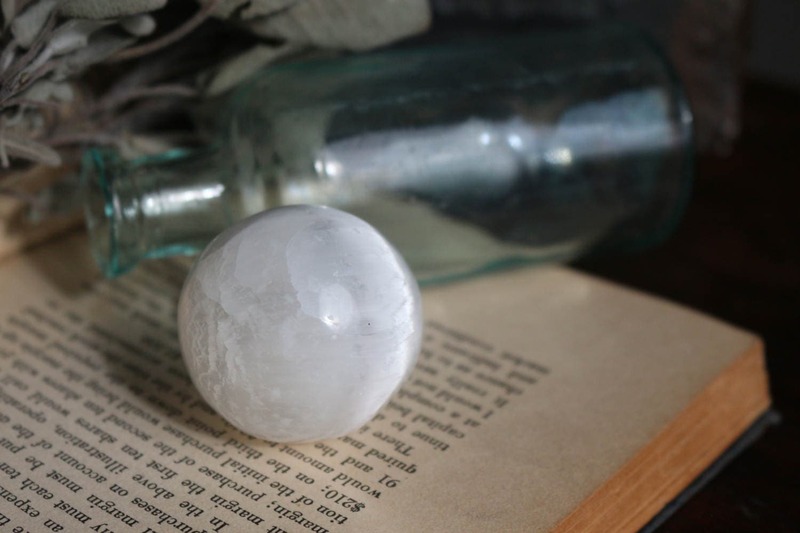 In Feng Shui, a Selenite Sphere or Tower is placed inside, at the four corners of your home, to create a peaceful and safe environment that will not be disturbed by outside influences. Selenite is also commonly placed near televisions, microwaves, cell phones, computers and other electronic sources to help gather and absorb the EMF (electromagnetic fields) generated. Selenite is associated with the Crown Chakra. Please scroll down for more information regarding our Store Policies as well as Frequently Asked Questions. Every Crystal in our inventory has been individually hand-selected as if we were purchasing for our private collection. We hope that you will find our products to be unique and meant just for you! We know how excited you are to receive your order! Please allow 1 to 2 business days for order processing, unless otherwise noted. Please note that all crystal healing, metaphysical definitions, and folklore indicated in our listings do not imply a guarantee of effect. Anyone who believes they are suffering from an illness should consult with their physician. The practice of "Crystal Healing" is a holistic complementary healthcare practice. To fulfill your order, you must provide us with specific information (which you authorized Etsy to present to us), such as your name, email address, postal address, payment information, and the details of the product that you are ordering. You may also choose to provide us with additional personal information (for a custom order of jewelry, for example) if you contact us directly. The GDPR requires that we explain the legal bases relied upon to collect, use, and share personal information. The legal bases may include a buyer’s affirmative consent to receive marketing messages, compliance with legal obligations, and a seller’s use of personal information in their legitimate interests. We may collect, use, retain, and share your information if we have a good faith belief that it is reasonably necessary to (a) respond to legal process or government requests; (b) enforce my agreements, terms and policies; (c) prevent, investigate, and address fraud and other illegal activity, security, or technical issues; or (d) protect the rights, property, and the safety of our customers, and others, where applicable. The GDPR requires us to disclose that we store personal information for business purposes and to comply with any legal or tax obligations. The GDPR requires us to disclose if you transfer personal information outside of the EU and the legal bases you rely on to do so, such as consent and contractual necessity. We use iCloud, as well as Google Docs, which are Privacy Shield Certified, and we rely on Privacy Shield as the legal basis for the transfer of our buyers’ personal information outside of the EU. We may store and process your information through third-party hosting services in the US and other jurisdictions. As a result, we may transfer your personal information to a domain with different data protection and government surveillance laws other than your authority. If we are deemed to transfer information about you outside of the EU, we rely on Privacy Shield as the legal basis for the transfer, as iCloud and Google Cloud is Privacy Shield certified. If you reside in certain territories, including the EU, you have many rights concerning your personal information. While some of these rights apply generally, certain rights apply only in certain limited cases. You may have the right to access and receive a copy of the personal information we hold about you by contacting us using the contact information below. You may also have rights to change, restrict our use of, or delete your personal information. Absent exceptional circumstances (like where we are required to store data for legal reasons) we will generally remove your personal information upon request. You can object to (i) our processing of some of your data based on our legitimate interests and (ii) receiving marketing messages from us after providing your express consent for obtaining them. In such cases, we will delete your personal information unless we have compelling and legitimate grounds to continue using that information or if needed for legal reasons. If you reside in the EU and wish to raise a concern about our use of your information (and without prejudice to any other rights you may have), you have the right to do so with your local data protection authority. For purposes of EU data protection law, So Good Mojo Co. is the controller of your personal information. If you have any questions or concerns, you may contact us at hello@sogoodmojoco.com. This information is for educational and informational purposes only; hence, the content is not legal advice. It is not intended to create, nor does not constitute an attorney-client relationship. So Good Mojo Co and Etsy, Inc. disclaim all responsibility for any losses, damages, or causes of action that may arise or connected with the use of these materials. Please consult a licensed attorney in your area with specific legal questions or concerns. Crystals and Minerals are generally asymmetric, and we cannot guarantee precise measurements. Every item in our inventory has as an in-depth detail as noted in each of our listings. Also, dimensions listed are at the largest area of the crystal for height, width, and depth. The weight of each item is recorded as well unless otherwise noted. For an accurate depiction of each product, we prefer to use natural lighting when photographing our inventory (unless otherwise noted). We believe natural light accurately depicts the item in its natural state vs. artificial lighting. Also, we do not alter our photos. So what you see in the picture is what you will receive in your mailbox. Please keep in mind that the appearance of each photo can vary depending on the method of viewing. Settings on individual devices such as smartphones, computers (Mac vs. PC), external monitors, notebooks, and so forth, appear slightly different if placed side by side. Our carrier of choice is the United States Postal Service (USPS). We offer many options for which you may choose using the drop-down menu while placing your order. For larger/heavier items, we may use another carrier such as UPS Ground Service our discretion. Please Note: The “Ship By” date noted when placing your order is not the actual delivery date. Processing time plus Method of Shipping will give you a better idea of when to expect your order to arrive. EU Customers |EU Consumers, as per the "European Union Directive on Consumer Rights," EU consumers are given special legal protections. Rules for online purchases sometimes referred to as “distance selling laws.” Laws and regulations may differ. Some products, including custom-made goods and perishables, are exempt from certain rules. RIGHT TO RETURN ITEMS/RIGHT OF WITHDRAWAL: Under the EU’s distance selling laws, buyers have the right to return specific products for any reason by contacting the business within 14 days. This 14-Day period begins the moment the customer receives the product, rather than at the time he or she purchases it. This rule DOES NOT APPLY to custom-made products, digital items, certain perishable items. All orders ship in our custom-designed So Good Mojo Co.© "gift-like" boxes which are sturdy enough to ship in and beautiful to gift in! All items arrive in our FairTrade, Recycled Organic Cotton Muslin Drawstring Bags along with other fun surprises and gifts! All packing materials that protect our pieces consist of post-consumer recycled products. Our bubble wrap is green in color and is a "GREEN" Product. It's recycled and recyclable. As noted above, we take great pride in all of our packaging products which are fun to receive. Kindly select "gift wrapping" at checkout.